Rick Woodward is a Learning and Development Consultant with extensive global experience particularly in Europe and the USA. Consultancy for healthcare professionals: Rick works extensively with medical professionals all over the world. This involves coaching senior doctors to communicate clearly about medicine, helping pharmaceutical companies with price reimbursement negotiations and training doctors in leadership skills. 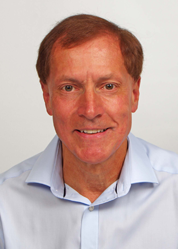 Rick works extensively in the NHS in the UK and has designed and led training and e-learning for over 3,000 NHS and private medical appraisers. General Consultancy: Rick’s experience spans work that includes coaching senior executives and sales representatives, leadership assessment using psychometrics and leading team development days. He is called upon to facilitate key business meetings and has been a keynote speaker at several international events including the annual CIPD conference. Consumer Goods: Rick was Global Learning and Development Director Kimberly-Clark heading up a twenty-strong team and dividing his time between the USA and the UK. He launched innovative programmes in leadership, coaching and change acceleration. He was also involved in the design of an award-winning performance management process covering 64 countries in 16 different languages. Pharmaceuticals: Rick has worked for both GSK and Bayer in senior HR and Learning and Development roles. He was responsible for designing global leadership programmes and designing performance management processes. General Industry: Rick was Interim Group HR Director/Head of Learning for Barloworld Handling – the largest independent fork lift truck company in the world. He designed and launched a global performance management process, set up e-learning (hosted on an LMS) and led training in leadership, appraisal skills and customer service. Rick is a Fellow of the Chartered Institute of Personnel and Development and has a Diploma of Management Studies (Distinction) and BSc (First Class) in Chemical Engineering.